The right gun, the right vehicle, or the right piece of equipment can be the difference between life and death. Shadowrun Gear Cards provide quick reference to 54 different pieces of gear. Containing game stats and illustrations of guns, vehicles, drones, and more, these cards will help keep the game moving and make sure characters have what they need to come out on top. 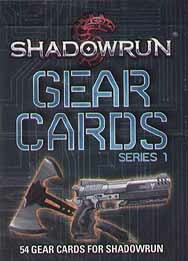 Shadowrun Gear Cards are for use with Shadowrun, Fifth Edition.